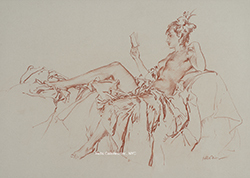 Sir William Russell Flint, RA began life as the eldest son of a modest Scottish family in Edinburgh. 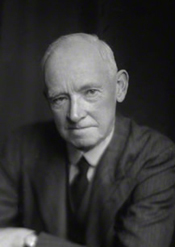 Born to Jane and Francis Wighton Flint on April 4, 1880, he was fortunate to grow up in an environment that was supportive of the arts in general. His father seems to have worked for the local constabulary, but also as a watercolorist and designer on a freelance basis. His mother was one of the first women to work in a civil service position in Scotland. Both parents encouraged all three of their children in active participation in the arts. Flint’s sister, Charlotte Elizabeth, was a musician and sufficiently gifted to study piano in Vienna with the renowned Polish pianist and composer, Theodor Leschetizky, who counted many of the finest pianists, including Ignace Paderewski, among his protégés. Although little is known of Flint’s brother Robert Turvis, it seems likely that he too was encouraged to enjoy the arts within the family. Flint’s general education began at Miss Clinkscale’s School in Portobello, then a resort town on the Firth of Forth just outside the urban boundaries of Edinburgh. (Today, it is part of the city.) Portobello in the 1880s was largely a resort community, full of tourists in the warm months, and claiming a somewhat romanticized history as a smugglers haven in the 17th and 18th centuries. For an imaginative young boy, it was probably a very exciting place. Leaving Miss Clinkscale’s School for Daniel Stewart’s College for Boys in Edinburgh brought Flint into contact with more academic art training. He had shown an early interest in drawing and painting which was encouraged by his parents, but it was during his years at school in Edinburgh that he learned drawing in a more formal context. During the early 1890s, he also began to study art in the evenings at the Royal Institute of Art (today the Edinburgh College of Art at the University of Edinburgh). After graduation in 1894, Flint worked as an apprentice for a lithographer. Here he learned illustration and printing skills as well as the discipline of hard work and consistent production. This foundation would serve him well when he set out for London on August 12, 1900 after completing his six-year apprenticeship. During his first eighteen months in London, Flint worked as a medical illustrator. He also spent long hours at the British Museum studying the vast range of collections and drawing whatever captured his attention. As he settled into London, he also began to cultivate freelance work as much as possible. During these first years in London, Flint also studied part-time at Heatherley’s School of Fine Art in Chelsea. Founded as a splinter group from the Government School of Design at Somerset House in 1845, Heatherley’s began with an independent curriculum where students were not constrained by overly restrictive academic traditions; it was also the first English art school to admit women on an equal standing with men. Not surprisingly, this open-minded attitude attracted some of the most forward-looking students of the day, including Pre-Raphaelite Brotherhood members Dante Gabriel Rossetti and John Everett Millais as well as Edward Burne-Jones and Walter Sickert. Even more crucial for Flint was the strength of the illustration program which counted Walter Crane and Kate Greenaway as alumni. Flint’s interest in illustration was foremost in his career plans during the first decade of the twentieth century, and Heatherley’s was the place to learn it. By 1903, Flint had established himself well enough to attract freelance work from The Illustrated London News, established in 1842 as the world’s first illustrated weekly news magazine. His first serious project for them was a series of illustrations for the Christmas week issue of the magazine in December 1903; this was followed in January 1904 with a commission for a full-page of illustrations of the private theatrical performances held at Chatsworth, home to the Duke and Duchess of Devonshire. Notably, these annual productions were also attended by King Edward VII and Queen Alexandra, thus exposing Flint to a whole new level of society. His illustrations—which naturally offered the best possible interpretation of the amateur performances—were a success. He was hired as a staff illustrator shortly thereafter. With a steady income at hand, Flint was able to afford a studio at 19 George Street near Portman Square (and reasonably close to the British Museum). Here he could work on his illustrations, develop his skills as a figure painter and focus on the growing number of commissions that were coming his way. In an effort to master the art of figure painting, Flint approached a potential model who had been recommended by a colleague in his life drawing class at Heatherley’s; he invited Sibylle Sueter to tea at his studio and soon was not only working with her regularly, but also spending considerable time with her. Sueter was part of a “Naval Service Family” which meant that both her father and her brother, as well as her ancestors dating back to the time of Elizabeth I, were all in service to the Royal Navy in some capacity. The young couple formed a strong commitment to one another, and after Flint had received a financially rewarding commission for the illustrations of Rider Haggard’s book King Solomon’s Mines, they were married on August 12, 1905. They honeymooned in Dieppe on the Normandy coast for a week before returning to London and work. This would be the first of many trips to France together in the coming years. Flint’s career as an illustrator was also progressing well during this period. It was a time when illustrations for books as well as magazines and newspapers were highly valued; the printing technology available for high quality color images was continually improving, photography had yet to emerge as a true journalistic medium, and the prevalence of illustrations in the “modern style” of art nouveau were extremely popular, both in England and the US. Flint continued to work at The Illustrated London News until 1907 when he had enough private commissions that he no longer needed to rely on the magazine. Among the most important of these clients was the Riccardi Press, which commissioned him to create illustrations for a number of books. Founded by Herbert Percy Horne (1864-1916), the Riccardi Press was the inheritor of the design reform principles established in the late nineteenth century by Horne and his colleagues at the Century Guild of Artists. Horne himself was the editor of the Guild’s magazine, The Century Guild Hobby Horse, from 1884-1894, where quality in design, content and production were fundamental to the aesthetic embraced by the Guild. Like their compatriots among the Pre-Raphaelite Brotherhood and the art nouveau designers on the continent, the artists associated with this magazine believed firmly in the unification of all arts and in the principle that high quality design should be available to everyone. Many of Flint’s instructors and classmates at Heatherley’s School of Fine Art shared these ideals, and no doubt, he was also influenced by this aesthetic. In 1909, the Riccardi Press began to collaborate with the Medici Society, an organization dedicated to producing artists’ work for the public. This meant the creation of a new imprint for the Press, also called the Medici Society, which specialized in limited editions of selected books. Flint soon became one of their primary illustrators, working on Thomas Malory’s Morte d’Arthur (1910), Geoffrey Chaucer’s The Canterbury Tales (1912) and Homer’s The Odyssey (1924). In the years before World War I, he also illustrated a number of books for Philip Lee Warner, one of the founders of the Medici Society, as well as a series of librettos for Gilbert and Sullivan operettas. All of these illustrations reflect the art nouveau design that was then transforming book production throughout the world. Simultaneous with his work as an illustrator, Flint continued to develop his skill as a painter, and in 1912, he received his first major recognition of this work when he was elected to membership in the Royal Institute of Oil Painters. Whether or not this honor influenced his decision, it was in this same year that Flint and Sibylle moved to Rome where they rented a studio on the grounds of the Villa Strohl-Fern next to the Villa Borghese. The history behind this villa is somewhat unusual in that it was intentionally created by an Alsatian nobleman, Alfred Wilhelm Strohl-Fern, as both his personal villa and as a kind of artists’ retreat in 1879. Once he completed the central villa, he built a number of artist studios throughout the surrounding gardens. Writers and visual artists alike were welcome to rent the studios as live/work quarters during their time in Rome. Back in London in 1914, Flint continued to work as an illustrator for weekly magazines, covering performances by Diaghilev’s Ballet Russe as well as many operas at Covent Garden, while also developing his painting. The geopolitical tensions of declining European monarchies was soon to erupt into war, however, and Flint found himself serving as a lieutenant with the Royal Naval Volunteer Reserve shortly after the outbreak of World War I. His position with the Royal Navy was undoubtedly linked to Sibylle’s brother, Murray, who was an admiral. During these years, they moved to Devon to be closer to Flint’s work on the development of rigid airships. From 1916-1918, he worked with the Royal Naval Air Service; and from 1918-1919, he was the Admiralty Assistant Overseer on HM Airship R34. In spite of the horror of this “war to end all wars”, there was also a time of rejoicing when Francis Murray Russell Flint was born on June 3, 1915. He too would grow up to become a painter. By the time of Flint’s discharge in 1919, the effects of World War I were clearly evident in Britain as well as other European nations. The geopolitical boundaries of Europe were radically altered, social status was defined more by the character of the individual than the lineage of a person’s family, and women were assuming an increasing number of previously unacceptable roles in society. The complex deconstruction of hidebound class structures and outdated social expectations were particularly difficult in Britain where the class system was deeply ingrained, but for someone like Flint, who had already demonstrated the ability to earn his way by merit, persistence and occasional good luck, these changes posed fewer challenges. The decade of the 1920s brought many opportunities, and an increasing interest from collectors in Flint’s watercolors and oil paintings. The watercolors were particularly popular, in part because they were more affordable for middle class patrons and in part because of their quality. Flint’s involvement in the Royal Watercolour Society, to which he had been elected in 1917, offered him a wider scope for exhibiting his work as well; his first venture into the American market occurred as a result when his work was included in an international exhibition of water colors at the Art Institute of Chicago in April 1922. As The American Magazine of Art noted in its review of this exhibition: “In the English representation nearly every artist is of international fame. England is the native land of water-color painting, and the art still flourishes more vigorously there than in any other country. Special mention may be made also of the works of Leonard Richmond, W. Russell Flint, J. Enraght Moony, and Charles Mackintosh.” [iii] In addition to the good review, Flint received the Brown Bigelow Purchase Prize of $500.00, which meant that his work would now be in American private collections as well. With such a promising beginning, Flint continued to exhibit at the Art Institute of Chicago throughout the 1920s. A trip to Spain in 1921, together with Sibylle and Francis, seems to have been a turning point in Flint’s focus on his painting. He spent some time traveling and painting in the Guadarrama mountain range north and west of Madrid where he was fascinated with both the rugged landscapes and the local people. Perhaps because of the site’s isolation, Flint found communities where traditional culture was still the lifeblood of the people; they seemed untouched by either industrialization or contemporary culture. This reinforced Flint’s commitment to documenting the life of ordinary people and the customs that he feared would all too soon dissipate in the wake of sweeping social change. Fortunately, these images of a world that was disappearing in the face of modernization proved to be very popular. As the decade moved on, Flint’s focus gradually shifted from illustration to painting. The mid-1920s brought two additional positive changes to Flint’s life. In 1924 he was elected an Associate of the Royal Academy; followed by full membership in 1933. For a British painter, this signified that his work was recognized as being of the highest possible quality. More mundane perhaps, but extremely important nonetheless was Flint’s move to Peel Cottage in Campden Hill, London in 1925. The cottage had long been inhabited by artists, but Flint would remain here for the rest of his life, enjoying the numerous improvements that he made to the building and savoring the security of family life without financial worries. It became his home base as he and his family traveled extensively up until 1939. Throughout the inter-war period, the Flints continued to explore all possible corners of France in pursuit of landscape motifs, cultural documentation and pure pleasure. On most school holidays, when young Francis was at home, they set off for St. Malo in Brittany where the walled port city offered exciting venues for a growing boy and ample vistas for a painter’s eye, not to mention that it was conveniently close across the Channel from England. In the same category were the cities of Senlis and Louviers in northern France where the cityscapes offered rich historical perspectives for Flint’s ever curious mind. Other journeys were more far-reaching: the Riviera, the Loire Valley and of course, Paris itself. But it was the Périgord region in southwestern France near Bordeaux that Flint most often visited. The rural landscape, the excellent cuisine and the medieval architecture caught his attention and held it for many years. He revisited the Château Bonaguil in this region many times, exploring the fortified castle—complete with thirteen towers—that reminded him vividly of his 1910 illustrations for the Thomas Mallory’s Morte d’Arthur. Flint’s reputation among his peers back in London was also growing. In 1931, he was elected to the Royal Society of Painters, Etchers and Engravers. In 1936, he was elected president of the prestigious Royal Society of Painters in Watercolour; and he would remain in this post until 1946. As war loomed on the horizon again, Flint and his wife left the terror of the Nazi blitzkrieg behind and temporarily moved to a turkey farm near Totnes, Devon, while Francis served as an Official War Artist. Although the now 60-year old Flints were reportedly amused by the daily antics of the turkeys, it was nonetheless a difficult period being uprooted from Peel Cottage, naturally concerned about their son’s safety, and increasingly troubled by Sibylle’s chronic crippling arthritis. In a time when funding for just about anything was scarce, the health care costs were formidable. The 1960s ushered in yet another new era in Britain as the social changes begun in the aftermath of World War I continued to undermine the entrenched class structures of centuries. At age eighty-two, Flint must have been amused by the reinterpretations of art nouveau that were emerging in contemporary psychedelic poster illustrations—brighter colors and different subject matter, but the same whiplash curves and free-flowing figural forms. The early 1960s were also highlighted by a special exhibition of Flint’s work at the Diploma Galleries at the Royal Academy in 1962. He remains one of only six Royal Academicians to receive this honor in the history of the organization. The retrospective included many of his best known paintings, many of them on loan from private collectors who were pleased to celebrate the artist’s work. Later that year, Flint returned to France on yet another painting trip; still healthy and fit, he persevered in the work. For Flint, it would appear that the joy of painting did not cease until leukemia took his life on December 27, 1969, just four months shy of his ninetieth birthday. [i] Ralph Lewis, Sir William Russell Flint, 1880-1969 (London & Edinburgh: Charles Skilton Ltd, 1980) 39. [ii] Ralph Lewis, Sir William Russell Flint, 1880-1969 (London & Edinburgh: Charles Skilton Ltd, 1980) 40. [iii] “International Water Color Exhibition” The American Magazine of Art, Vol. 13, No. 5 (May 1922) 168-170. [iv] Only 1050 copies of Flint’s autobiography, In Pursuit, were published by the Medici Society on the anniversary of what would have been his ninetieth birthday in April 1970.